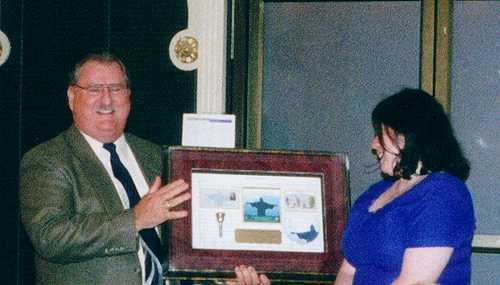 On 31 May 2002, the National Capital Band, based in Washington, DC, gathered for a dinner marking the end of the band’s 76th consecutive annual season of service. The 2001 – 2002 season was one of the band’s more eventful, beginning inauspiciously with the cancellation of a Divisional Music Councils in September, which was to have featured a visit from the New York Staff Band. The season continued with some high points, including a five-day “mini-tour” of the southern United States in October and three patriotic concerts at the Jefferson Memorial, including a joint concert with the Derby Central Songsters in March. The season’s actual end fell after the dinner, with performances at the USA Southern Territory Festival of Faith in Atlanta. In addition to celebrating the season past, a major part of the evening was given over to saying farewell to those members who had left the group since last year’s dinner. This season was a difficult one, with fourteen on the farewell list, including the Bandmaster, Deputy Bandmaster, Band Secretary, Band Sergeant, and Quartermaster. The dinner, held at Phillip’s Flagship restaurant, located in the waterfront area of Washington, began with a quiz (a feature of the annual dinner which is becoming a tradition with the band). Twelve questions, having to do with the history of the band, were posted at various locations in the banquet room. Following the blessing, the members and guests filed into the main area of the restaurant for a buffet of seafood and other delights. After having determined that an appropriate amount of food and drink had been consumed, the master of ceremonies for the evening, Ian Anderson, began the evening’s events. First, the answers to the quiz were given by Robert Schramm. Next, Bernie Dake updated the flag display. This set of miniature flags is displayed in the band’s rehearsal space at the Divisional Headquarters, and contains a flag from each nation and from each U.S. state where the band has played. This year, two new states (Tennessee and Alabama) were added (as well as a new one for the state of Georgia, because the state has changed its flag). The highlight of the first portion of the evening was the presentation of Bob’s Big Note. 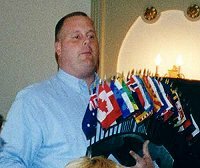 Begun by former Band Secretary Bob Goodier at the band dinner in 2000, the Note honors a member of the band who shows dedication to the band, its mission, and exemplifies Salvationist ideals in general. The Note is passed on each season by the previous year’s recipient, who must chose the next honoree. This year, the Note was passed from Tammi Hewitt to Keith Morris. Because of the large number of persons leaving the group this season, the bulk of the evening was spent in saying farewell. Major Todd Smith, the band’s Executive Officer, presented certificates to those who are departing, including Connie Barrington (not present), Tom Bratten (not present), Laura Dake, Mark Gates, Aaron Goldfarb (not present), Cheryl Hodges, Captain Richard McConniel, Patricia Snelson, and Luis Torres (not present). Special recognition was given to the five members of the Band Board who are leaving the band. 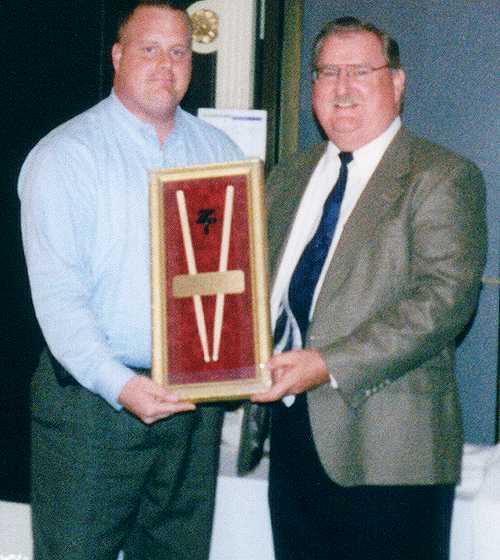 After serving for several years as the Music Director at the Fairfax Corps in Fairfax, Virginia, and three seasons as the Deputy Bandmaster of the National Capital Band, Andy Barrington left the Washington area at the end of March 2002 to become the Divisional Music Director of the Arkansas-Oklahoma (AOK) Division. His wife, Connie, also a member of the NCB, will serve as Christian Education Director for the AOK Division. In addition to his duties as Deputy Bandmaster, Andy also served as the principal tuba of the band and Connie served as principal horn. The Barringtons have two children, Anthony and Ella (who was born shortly after their move to Oklahoma City). Andy’s parents, Majors Tony and Suzanne Barrington, corps officers at Alexandria Citadel, Virginia, are also members of the National Capital Band. The Barringtons could not be present at the dinner because of their responsibilities in their new positions. They were presented with their certificates of appreciation during the Festival of Faith in Atlanta, Georgia in early July 2002. One of the last remaining band members who participated in the 1989 tour of Australia and New Zealand, Bernie Dake is leaving the group in order to concentrate on his graduate studies. His wife, Laura, is also leaving the band this year. Bernie was presented with a specially designed plaque and those present were treated to a video retrospective of his career with the band, including a full presentation of his bungee jump in Stockholm during the 1991 Scandinavian tour. In addition to being principal percussionist, Bernie served for several years as the band’s Quartermaster and also served as Band Secretary for a time. He and Laura attend the Arlington Citadel Corps in northern Virginia. Dorothy Gates joined the trombone section of the National Capital Band in 1993, when she moved to the Washington, D.C. area with her husband, Mark. She has held a number of positions on the divisional headquarters staff, including Volunteer Coordinator and, most recently, Assistant Divisional Music Director. In the past few years, she has become well-known as a composer of both brass band and vocal items. 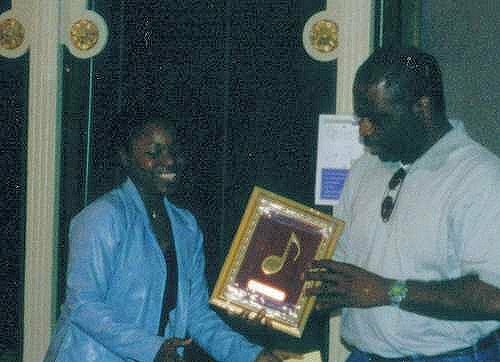 Three of her pieces were featured on the latest NCB recording, Turning Point (2001), including the title track, which was written for the dedication of a transitional housing facility in Northeast Washington. In addition to her duties with the NCB and the divisional music department, she has also served in several roles at the Prince George’s, Maryland Corps, including bandmaster (1997 – 1999), songster pianist, and youth bandmaster. Dorothy is moving to the New York City area this summer, following the conclusion of the National Capital and Virginia Music Conservatory. She has been hired as the Music Editor for the USA Eastern Territory. Although he does not play a instrument, Mark Gates was also recognized for his contributions to the National Capital Band. For the last several years, Mark has provided multimedia presentations used during concerts and served in a supporting role with the band. One of two National Capital Band members entering the College for Officers’ Training in Atlanta this fall, Mike Harris has served in the tuba section for a number of years. Originally from Coventry, England, Mike has recently been an administrator with the City Command in Richmond, Virginia. He has also served as the Richmond Citadel bandmaster. After thirteen years as Divisional Music Director in the National Capital and Virginia Division and four seasons as Bandmaster of the National Capital Band, Lars-Otto Ljungholm and his family will return to Sweden in July 2002. Lars-Otto has made the music programs in the NCV division models for the entire territory, and his consistent and competent leadership has made the music forces of the division some of the strongest in the South. In 1998, he was called from his seat as the principal cornet of the NCB to the position of Bandmaster with less than a week’s notice before the beginning of the band’s season. During their time in the Washington area, the Ljungholms have been active in their home corps, Prince George’s, Maryland (and one year at the Fairfax, Virginia corps). Lars-Otto has served as the bandmaster and youth bandmaster at various times, and his wife, Ingrid, has been an alternate songster leader and worked with the singing company (youth songsters). Both have been pianists for meetings and songsters. Upon his return to Sweden, Lars-Otto will become the manager of the Gothenburg Opera Orchestra. Ingrid will be teaching music at the Johannebergsskolan (the same school as their children, Erik and Anders, will attend). This article was posted in News and tagged Aaron Goldfarb, Andrew Barrington, annual dinner, Bernie Dake, Cheryl Hodges, Connie Barrington, Dorothy Gates, farewell, Lars-Otto Ljungholm, Laura Dake, Luis Torres, Mark Gates, Mike Harris, National Capital Band, Patricia Snelson, personnel, Richard McConniel, special event, Tom Bratten on 3 July 2002 .